We have 14 restaurants Now Open, but check out our Frederick, MD or our four restaurants in the Raleigh-Durham market to get "The Shack" experience firsthand! 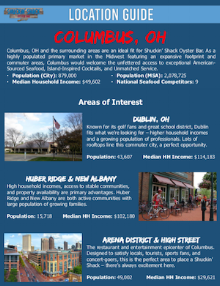 Request our Columbus Locations Guide to gain insight into the neighborhoods most likely to welcome a new Shuckin’ Shack Oyster Bar! 2. A prime opportunity to get in with a proven concept in an untapped market that has been identified by Forbes as #11 Best Places for Business and Careers.